The museum applies for grants to help supplement their admission and membership fees. As a non-profit organization, larger contributions made by companies across Canada are greatly appreciated. These contributions are applied to larger projects and building maintenance as needed and decided by the membership. Please contact us if you would like to make a donation. The museum is operated by a very large, dedicated group of volunteers who pay an annual membership fee. In addition to this, admission fees were recently implemented and help with the ongoing maintenance of the museum buildings and large grounds. Always held on the second Sunday in August, this fun-filled day is meant for all ages. Although funds are raised on this day, the main goal for this annual function is to show our appreciation to the community and everyone who contributes to the museum in any way. Take home a momento of your visit with the Log Cabin Tea House Cookbook - a fantastic collection of recipes compiled by many residents in this area. Souvenir museum caps as well as history books by local authors are a few more of the items available to purchase and support the museum. 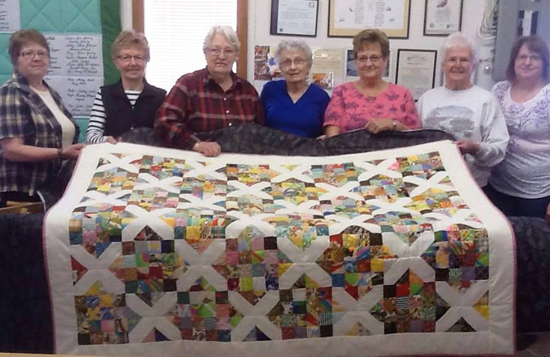 Each off-season, a group of lovely volunteers gather together weekly to complete a minimum of 2 beautiful quilts to be raffled off at our Annual Frenchman Butte Museum Festival. This has been a custom for many years and the hopeful winners are always in awe of the fine work and detail that goes into each one. Tickets can be purchased at the Log Cabin Tea House or by contacting Marilyn Hougham at 306-825-2246. Tickets are also located at the Synergy Credit Union in Paradise Hill and the Paradise Hill Farm Supply.